Regardless of these matters, L. aurea is a lovely flowering bulb. The first time I saw one in north Florida I thought my eyes were deceiving me. It appeared that I was looking at a deciduous azalea, perhaps Rhododendon calendulaceum, on steroids. There were a couple problems with this – first of all, it was late summer, and the flowers were seemingly springing magically from the ground. Any person seeing Lycoris in flower for the first time has a similar experience, hence the common name surprise lily. 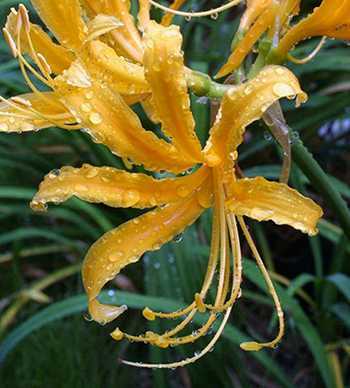 The flower trusses of Lycoris aurea remind me of a deciduous azalea on steroids! Here in southern Japan plants usually flower in October, after L. radiata has finished or is finishing. I have two clones, an early flowering one and another that flowers a whole two weeks later. Of the two, the later flowering clone produces seed while the other doesn’t. I have not tried to germinate these since it is said that Lycoris are ridiculously slow to flower from seed, with a minimum of 5 years needed. This season though, I’m giving them a try. 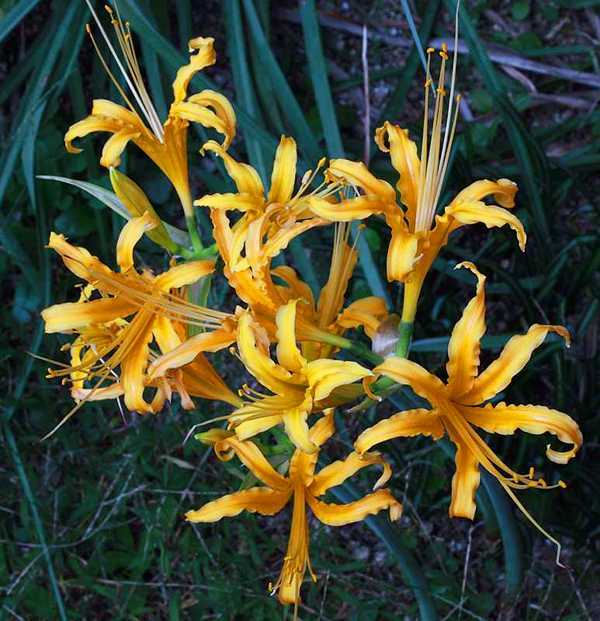 It is said that Lycoris aurea likes limey soils and a dry, hot summer. While this may be true, the plants I grow stay wet until early August at least. Around the second week of August and into late September the rains back off and the oven turns on in Kyushu with daily highs peaking in the mid 30’s C (~94 F). This period of dry heat is supposed to enhance flowering in this species. I do not add any lime to their bed either, and the local volcanic loam is definitely acidic in reaction. The plants do like a sunny location, perhaps even more so than L. radiata. Mine are in a spot that gets relatively little sun in the winter months and I’ve noticed they don’t flower as well as plants I’ve seen in full sun here. Lycoris aurea is the largest of all the Lycoris. In some vigorous specimens the leaves can reach nearly a meter in length. The leaves at the lower right are those of L. radiata. 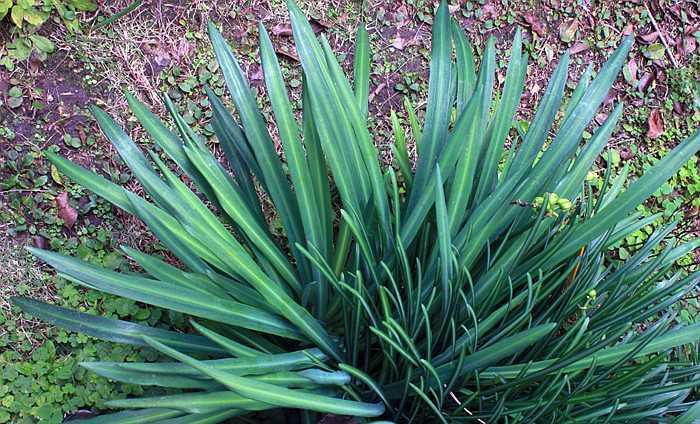 New plants can be made through offsets, though recently planted bulbs often go through at least one year of sulking, particularly ones that have been dried and are rootless. This adds to the surprise element, because it is easy to forget you even planted a bulb two years earlier only to have it flower by seeming magic later on. They produce offsets fairly generously. The first bulb I planted has increased to a clump of at least 12 plants, and in a relatively short span of time – around 5 years. In nature these are plants of subtropical grasslands and forest edges. 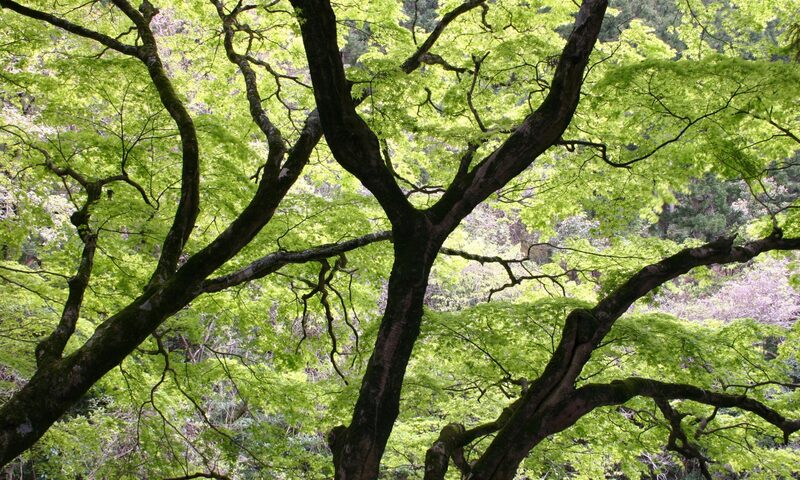 In Japan they are grown well into warm temperate areas where the soil doesn’t freeze in winter. Still, their soft, succulent leaves are not likely to take truly cold winters. It is likely that USDA cold hardiness zone 7 is their limit without protection. 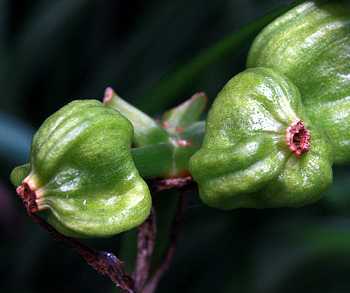 In Japan L. traubii has been used as an emergency food in times of famine, in particular after WWII. Since Lycoris bulbs contain the toxic alkaloid lycorine, great care was needed to remove it before eating the starchy bulbs. Lycorine has also been used in Asian folk medicine as a diuretic and expectorant, but dosing is a serious problem. Too much of it leads to vomiting, diarrhea, convulsions, and possible death by paralyzing the central nervous system. A far better use for the golden spider lily is as a garden subject. Few plants can give the startling display a well grown Lycoris can, and L. aurea is the king of this genus. Hi, just wanted to say I found your webpage on Lycoris aurea extremely interesting. I have been trying to figure out for some years the conditions needed to get the best out of these bulbs and this year seemed to be exactly what they wanted. I am at 1340m above sea level in northern NSW, Australia, on basalt soils that are neutral to acidic. Normally we get two or three snowfalls each winter and about two days over 30degC in summer. Annual rainfall is about 900mm with much of this in summer. This year was a warm winter with only one snowfall and a record hot and dry summer. My Lycoris have been at the foot of a north west facing stone wall for three years and this year seems to have been exactly what they wanted. The previous year’s flowering with a wetter summer was not nearly so good. Also, if not planted against a north facing stone wall, the leaves are burnt off by the frosts and they do not flower. In a normal winter we can get overnight minima down to -12degC, but mostly 30-40 nights down to -3degC. Next summer, I am going to trial covering the bulbs from mid-December to mid-February with a strip of black plastic to try to re-create this year’s dry hot summer. Thanks for a very helpful webpage. I’m glad I could be of some help. I didn’t expect such low temperatures, even at 1340 meters, at your location. It is amazing how much altitude can change things. Here on Kyushu anything above 1500 meters has some pretty serious winters, while down in the lowlands where I live it is almost, but not quite, subtropical. Lycoris aurea likes hot weather, as does L. radiata. Perhaps you would be better trying L. sanguinea since it is a true mountain plant even here, liking slightly cooler summers, while handling colder winters. Hi botanty boy thank you so much for sharing details of Lycoris Aurea. I’ve got bulbs for this plant from a local nursery. I am in India and was wondering how much time will it take for the bulbs to bloom of I plant them mid April? Im form argentina and dont wuite get when is that they flower (summer/spring/autum or winter, when to plant the bulbs (sping/summer/autum/winter)?? Since our seasons are reversed here in the north, I recommend simply planting the bulbs when you get them. They do not like being rootless and will take a season or more to settle in correctly. When they will flower for you is a mystery to me, but I’m guessing sometime in May or June?